Sash Window Preservation are passionate about giving young people an opportunity with apprenticeships. Our most recent member to qualify with an NVQ Level 2 in furniture making is Lewis Osbourne. Lewis joined the team approximately 2 years ago and in that time we have seen him grow from a young and shy 16-year-old to a fully fledged member of the joinery work shop. He always works with a smile on his face and we’re very proud that all his hard work and dedication has paid off with the qualification he has now achieved. Congratulations Lewis! Sash Window Preservation will be exhibiting at Grand Designs Live from 2nd to 10th May at London Excel. We are giving away two tickets for entry valid for one day. Grand Designs Live is the UK’s number one, award winning contemporary home show. It offers visitors a unique opportunity to see all the latest trends for the home. If you are planning a project in your home or simply looking for ideas or inspiration, you will find everything you need for your very own grand design at Grand Designs Live. Draw will be made on 30th April and tickets sent out shortly after. Sash Window Preservation now offers a superb range of quality finishing touches to complete your sash windows. View our full range of pulleys, latches, lifts and secure stops. Why not come and join us on Facebook to see more information on some of the properties we have had the pleasure to work on. All you have to do is ‘like’ our page and you will be updated with all of our recent news and information without having to come back to our website. It’s an easy way to see when we are in your area, updates on any new services we offer, and share with your friends who may find our page of interest. You can also enter yourself into our free prize draws for hampers, vouchers and other prizes. We look forward to seeing you on there. Just click here to be directed to our page and just press the ‘like’ button. No matter what type of timber project you have in mind please feel free to discuss this with our master craftsmen. With machinery and the skills to match, you can be assured that Sash Window Preservation Joinery will meet the needs of its clients. 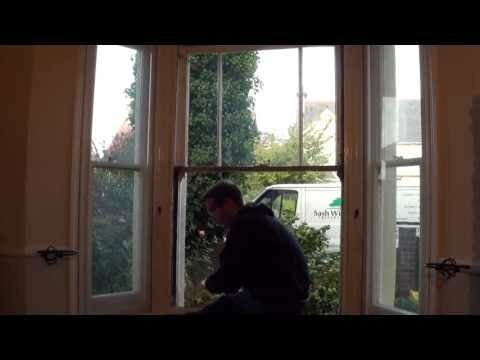 This demonstration video shows the process involved in double glazing existing timber frames.